In Russia one can now take a ride in military style. The taxi’s armor protects passengers from bullets and shrapnel and is being called the "safe taxi." Since the beginning of the year in St. Petersburg ICRMs - infantry combat reconnaissance machine - have been on patrol. These ICRMs are real armored vehicles with a spinning tower and an artificial large-caliber machine gun on top. The armor is one-centimeter thick and can protect passengers from bullets or shrapnel. Machine-gun fire wouldn’t stand a chance. Military taxis have occasionally been available throughout the world as marketing ploys. For example, in 2011 tracked tanks with guns appeared on the streets of London. This was a promotional campaign used by Electronic Arts before launching the Battlefield 3 video game. There are also other unusual taxis. The Yellow Air Taxi operates in Florida, U.S. It is a Cessna 402C airplane that can carry nine passengers and a pilot. It is painted yellow and is decorated with checkers. Air taxis are also very popular in Moscow: helicopters from four different companies can transport up to seven passengers each. The most requested routes are from heliports to the airport. A helicopter taxi ride costs significantly more than one in an armored vehicle: about $766 an hour. The ICRM is painted bright red, with checkers and the company's trademark. Passengers enter the vehicle by ladder through a hatch on the upper part of its body and take their places on real military vehicle seating. Yana Nezhintseva, a company representative of this "safe taxi" told RBTH that the new service is more popular than the company had expected. "We launched the project around the New Year and we now have several orders a week, even though we don’t have a marketing campaign,” says Nezhintseva. “We are thinking of buying and launching a second armored vehicle. We will modernize it for better comfort by improving the climate control and making the entrance more accessible." The ICRM currently traversing the streets of St. Petersburg is rather ascetic. It doesn’t even have heat, although it’s not too cold inside as the engine and air circulation units provide some warmth. In warmer weather the ICRM can travel through rivers. The amphibious vehicle’s capabilities have not yet been fully tested. The taxi does not violate traffic laws, nor does it enter the city center. This is not because it is a military vehicle, but because of its weight, a rule that also applies to cargo trucks. Weight restrictions must also be taken into consideration when crossing several bridges over the Neva, although the seven-ton ICRM can use most of them. The vehicle has a speed of up to 100 kilometers per hour, reduced to 19 in the water. Currently, the ICRM is mainly in demand for birthday or bachelor parties. The cost is approximately $90 an hour. "Hardly anyone will just go from one house to another," says Nezhintseva. "The car requires lots of fuel - at least 40 liters for 100 kilometers. A special driving license is needed to operate it and it’s not easy to drive. This is why is why it's difficult to imagine the car as being more than a luxury or novelty item." Passersby often take pictures of the armored vehicle and cars frequently honk when passing it. There is no political subtext in the project, its organizers say. 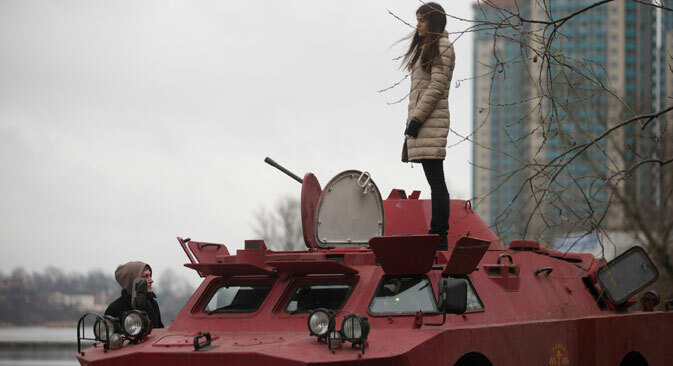 This is not the only armored car to have obtained a "second" peaceful life in Russia. Almost anyone can buy an ICRM on the internet with prices being similar to those of ordinary cars, ranging from $8,600 for a battered ICRM to $25,000 for one in mint condition. However, ICRM owners complain in social networks that it is difficult to obtain the corresponding type of license and register the car with the authorities.